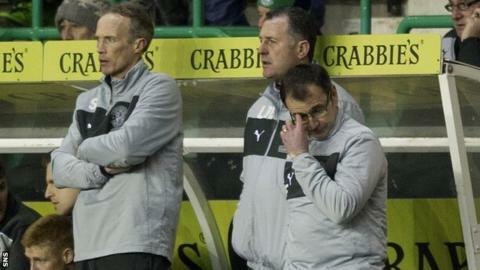 Hibernian manager Pat Fenlon lamented a "shocking" performance from his side in the 3-1 defeat by St Johnstone. A first-half double by Rowan Vine and Patrick Cregg's second-half strike put Saints in command before Leigh Griffiths' late consolation. "We got bullied and bossed and never got going," Fenlon told BBC Scotland. "It's embarrassing. I don't think we worked hard enough. St Johnstone played well but they worked really hard. We just went through the motions." And he added: "We never worked hard enough and that's the most disappointing thing. "We haven't had that for most of the season but over the last few weeks we haven't shown the desire to win football matches. "It just wasn't good enough." Hibs remain in the hunt for second place in the Scottish Premier League, despite dropping from fourth to fifth, and are also still in the Scottish Cup. But Fenlon added: "That doesn't mean anything and I think that's what people need to get out their heads. "We've started [the season] alright but over the last few weeks we've lost a little bit of desire and a little bit of the hunger. "You don't mind getting beaten and there's a way to lose and we didn't show any real fight and desire to get something out of the game."